Study the background, structure, and significance of the global climate change agreement. 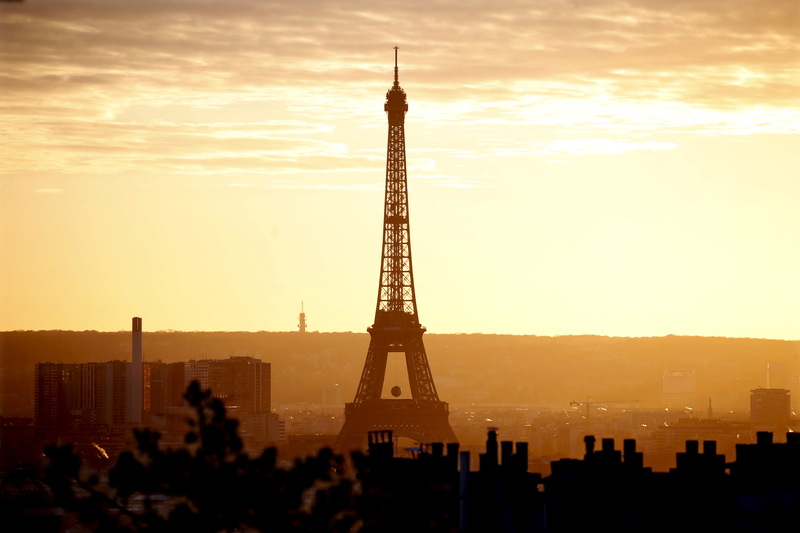 The Eiffel Tower at sunset in Paris, France on November 22, 2015. The capital hosted the World Climate Change Conference 2015 (COP21). 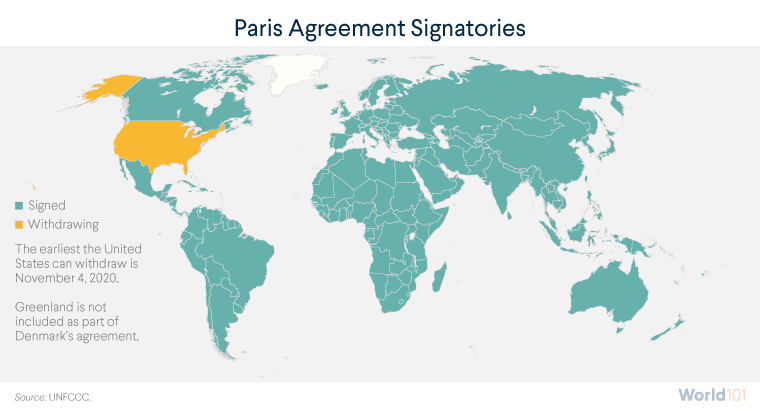 On December 12, 2015, in Paris, France, 195 countries agreed to the text of the first truly global climate change agreement. Known as the Paris Agreement, the accord commits nearly every country in the world to lowering greenhouse gas emissions. It was the product of nearly nine years of negotiations, and entered into force on November 4, 2016. The Paris Agreement revolutionizes climate politics by changing the model of negotiations. 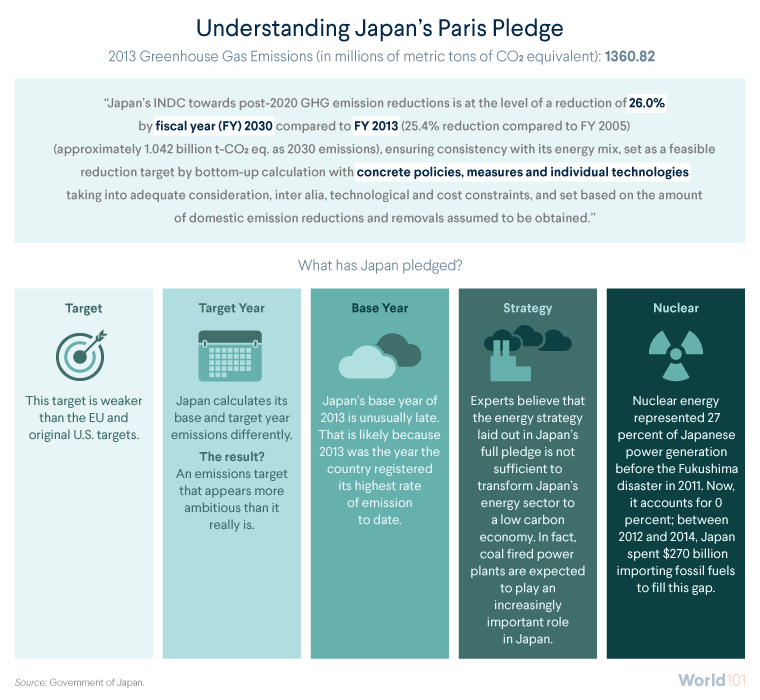 Instead of making a distinction between developed and developing countries, like in past agreements such as Kyoto, the Paris Agreement relies on a voluntary commitment by all countries to restrict their emissions and combat climate change. The only exception to the agreement is the United States, which announced its decision to withdraw in June 2017. The Paris Agreement aims to limit global warming by 2 degrees Celsius, or about 3.6 degrees Fahrenheit, above pre-industrial temperatures. To achieve this goal, countries put forward individual plans, known as Nationally Determined Contributions (NDCs), that outline their proposed emissions reductions and adaptation strategies. While the Agreement requires every country to submit a plan, there are no stipulations dictating how, or by how much, countries should cut emissions. There are also no strict guidelines on content, scope, or format. Thus, NDCs can differ significantly, varying with regard to their specific goals, level of ambition, measurements of emissions cuts, and even document length. The one thing that unites NDCs is that in their current state, they are insufficient to achieve the Paris Agreement’s objective. Bhutan and Japan represent two ends of this spectrum. 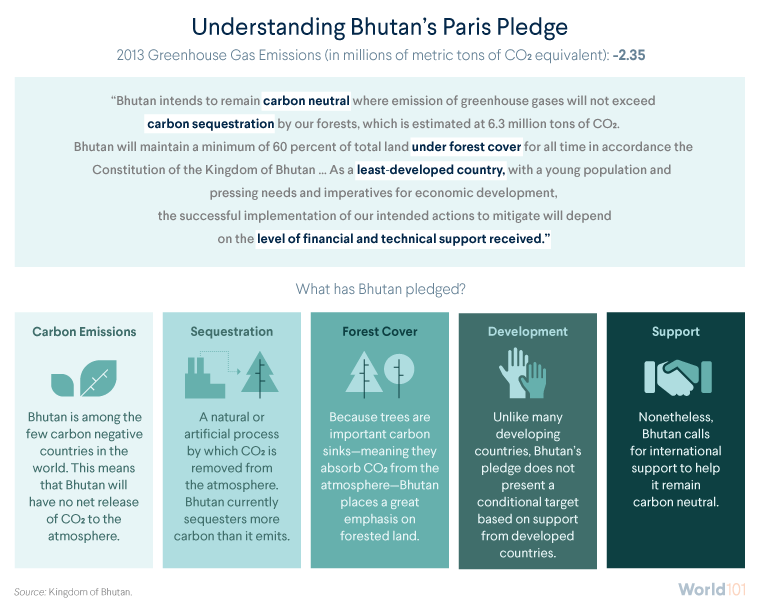 Bhutan, a landlocked, forested country in South Asia, submitted a climate pledge considered to be exceptional. Japan, a rich, populous country in East Asia, was singled out as one of the many developed countries whose pledge fell short. Criticism of the Paris Agreement often targets developed countries’ pledges for their seeming inadequacy. Plus, most of the pledges of the top ten emitters are inconsistent with the global climate target of limiting warming to below 2 degrees Celsius. Many of them are vague, unclear, and short, missing important details on how the country plans to actually tackle climate change. According to the Climate Action Tracker, out of the top ten emitters, only India's pledges, long-term emissions targets, and current policies are compatible with the Paris Agreement. If all governments had pledges similar to those of the other top ten emitters, global warming would exceed 2 and maybe even 4 degrees Celsius. One thing is certain: the Paris deal will not, on its own, solve global warming. Experts say that at best, it will cut global greenhouse gas emissions by about half of what is necessary. In the absence of any sort of policy, global warming is expected to reach over 4 degrees Celsius above pre-industrial levels by 2100. The voluntary pledges made by governments so far would limit warming to about 2.8 celsius. This means that substantially more action is necessary to stave off global warming. The Paris Agreement does, however, have provisions for a “ratchet mechanism,” designed so that NDCs grow more aggressive over time. The ratcheting process serves two functions. First, it helps determine the success of existing country pledges; second, it provides a system by which climate efforts can be consistently intensified. Every party to the Paris Agreement is required to either update or submit a new NDC, at minimum, every five years. Each subsequent NDC must be more ambitious than the last—in other words, the updated plans must ratchet up the stringency of emissions targets and other actions. 2018 marks the start of the ratcheting process. Countries convene for a “facilitative dialogue,” or check-in, at which they assess their progress toward the Paris Agreement’s long-term goals. They then use this information to rewrite pledges for 2020. Next, the ratcheting process becomes a cycle of NDC submissions and “global stocktakes,” or performance reviews. Countries gather every three years after each submission of new NDCs to evaluate the pledges. A global stocktake is more wide-ranging than a facilitative dialogue, and considers updated climate data and effects of existing NDCs. This process is crucial to ensuring the Paris Agreement reaches its “well below 2°C” target. It also makes climate change policy particularly susceptible to the actions of future governments. Although a specific country’s NDC might be especially ambitious now, nothing can stop its future leaders from weakening its climate policy or withdrawing from the agreement, as the United States did in 2017. Moreover, because all pledged actions are voluntary, adherence to the agreement depends, ultimately, on global peer pressure.